UK, 2008, 106 minutes, Colour. Nicki Bell, Liam Boyle, Stephen Graham, Holiday Granger, Oliver Lee. A visually murkey look at a murkey football hooligan group in Liverpool. 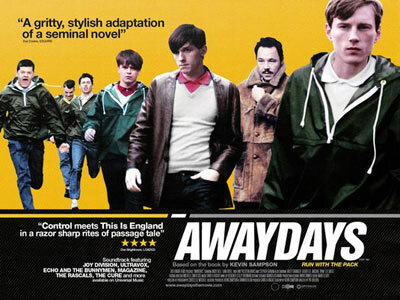 You probably need to be a strong fan of this kind of football film (although there are no visuals of any match, only the fans and their shouting in support during play and their brawling with opposition thugs) to be interested in Awaydays. The central character seems to be miscast or the writer has given him contradictory things to do. At some stages he seems withdrawn and quiet with a potential for doing something worthwhile with is life. At other times, he is unelievably brutal and sexually aggressive. His close friend (whom he can drop without much compunction) is also contradictory, an addict, tagging along with the local gang but then a seemingly closet romantic. This is offered as a slice of Liverpool life but the characters do not really engage our attention as they might and the string of episodes (with their contradictions) don't quite gel as a satisfying plot. 1.A particularly United Kingdom story? Liverpool-based? How universal? 2.The world of laddish behaviour, the culture of the 1970s? Parallels with other cultures? 3.The city of Liverpool, homes, pubs, the trains, the football matches (with no action seen)? Grey and colourless world? The contrast with the sea and the ships? 4.The musical score, the range of songs from such groups as Joy Division, Ultravox, The Cure etc? 5.The opening in the cemetery, the going back three months? 6.Carty: his age, in himself, at his mother’s grave, with his sister and father, changing, running to the train, with the group, the behaviour on the train? The issue of what he wanted? His dull work life? His sketching? His friend at the office? The group, wanting to belong, some kind of self-affirmation, masculinity? Some acknowledgment of himself? 7.The group, the range of types, their ethos, behaviour, on the train? Godden as the leader? The comment about how he hadn’t grown up? His being in control, initiating the brawls? The card games on the train? Drinking in the pubs? His initial disapproval of Carty, Carty slashing a throat and getting Godden’s approval? The role of Elvis in the group? Carty and his refusal to do drugs, Elvis and the drugs? The pub behaviour, sexual attitudes, humiliating people? The violence? Godden being stabbed by Baby, Baby and the drugs? The funeral? 8.Carty and his violence, the performance of the actor seeming to be unemotional, the eruptions of anger? The fight with the thugs, drawing blood? His bashing people? His sister injured by the rugby club member, his being bashed, getting his revenge? Sexual attitudes, the girl at the pub? Going to Elvis’s house with the two girls, his behaviour? His care of his sister? His friendship with the girl from the pub, leaving her at home looking after his sister? 9.Elvis in himself, his being part of the group yet despising him, his home, the posters, the noose to remind him of mortality, his drugs, living at the edge? The alienation from Carty? His being hurt? His sexual orientation? Carty’s return, their going to bash the rugby man? The funeral, wanting to make his confession to Carty, in the confessional, declaring his love, asking Carty to come with him, his wanting to go to Berlin? Carty rushing for the train, waiting for Elvis, Elvis sitting, disappearing into the smoke? 10.Carty as a credible character, within this culture, his strengths and weaknesses, a lost man? 11.The author of the original novel, the screenplay? His memories – and the purpose for making this film?